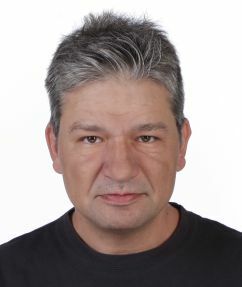 Dr. Xenophon Zabulis is a Researcher at the Institute of Computer Science - Foundation for Research and Technology, Hellas. He received the B.A., M.S. and Ph.D. degrees in Computer Science from the University of Crete, Greece, in 1996, 1998 and 2001, respectively. From 2001 until 2003 he has worked as a Postdoctoral Fellow at the Computer and Information Science Department, at the interdisciplinary General Robotics, Automation, Sensing and Perception laboratory and at the Institute for Research in Cognitive Science, both at the University of Pennsylvania, U.S.A. 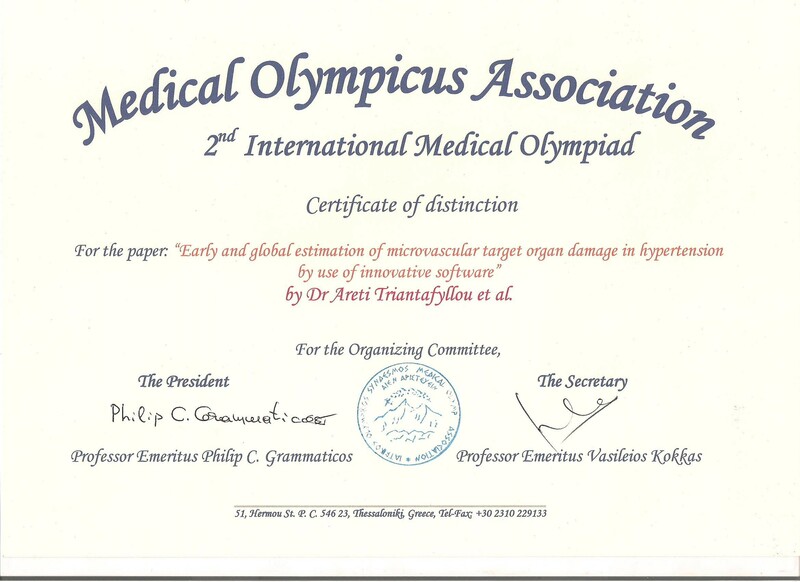 In addition, during 2004 to 2007, he has worked as a Research Fellow at the Institute of Informatics and Telematics, Centre of Research and Technology Hellas, Greece. His research interests are in the areas of stereo and multiple-view computer vision, 3D reconstruction, human motion estimation, medical image processing, human vision, and applications of computer vision for human-computer interaction and smart environments. Demonstration and paper videos: YouTube. P. Anyfanti, A. Triantafyllou, E. Gkaliagkousi, X. Zabulis, P. Dolgyras, V. Galanopoulou, S. Aslanidis, S. Douma, "Urinary albumin excretion in rheumatoid arthritis is not associated with markers of vasculopathy in distal microvascular beds", Microcirculation, Nov. 2018, doi: 10.1111/micc.12514. G. Margetis, X. Zabulis, S. Ntoa, P. Koutlemanis, E. Papadaki, M. Antona, C. Stephanidis, "Enhancing education through natural interaction with physical paper", Universal Access in the Information Society, Special Issue: "User Experience and Access using Augmented and Multimedia Technologies", 1-24, 2014, doi: 10.1007/s10209-014-0365-0 PDF. G. Galanakis, X. Zabulis, A. A. Argyros, "Novelty Detection for Person Re-identification in an Open World", In International Conference on Computer Vision Theory and Applications (VISAPP 2019), Scitepress, Prague, Czech Republic, 25-27 February 2019. N. Partarakis, G. Margetis, E. Zidianakis, M. Sifakis, G. Drossis, C. Birliraki, A. Chatziantoniou, V. Neroutsou, S. Paparoulis, T. Toutountzis, P. Koutlemanis, X. Zabulis, S. Ntoa, D. Gramenos, E. Apostolakis, E. Stamatakis, M. Antona, C. Stephanidis, "Interactive City Information Point: Your guide to Heraklion City", International Conference on Human computer interaction, 2018, Las Vegas, July 2018. A. Triantafyllou , P. Anyfanti , X. Zabulis, E. Gavriilaki, K. Petidis, E. Gkaliagkousi, P. Karamaounas, V. Golias, G. Triantafyllou, B. Nikolaidou, S. Douma, "Συσχέτιση της αορτικής σκληρίας με την υπερτασική αμφιβληστροειδοπάθεια σε νεομφανιζόμενη υπέρταση σε σύγκριση με νορμοτασικά άτομα", Αρτηριακή Υπέρταση 2013; 22(2):152-160 (in Greek). P. Anyfanti, A. Triantafyllou, X. Zabulis, P. Karamaounas, E. Gkaliagkousi, S. Aslanidis, S. Douma, "Αξιολόγηση των διαμέτρων του αγγειακού δικτύου του αμφιβληστροειδούς σε ασθενείς με ρευματοειδή αρθρίτιδα", Πανελλήνιο Συνέδριο Υπέρτασης, Thessaloniki, 6-8 April 2017 (in Greek). P. Anyfanti, A. Triantafyllou, X. Zabulis, P. Karamaounas, C. Zamboulis, S. Aslanidis, S. Douma, "Detection of Retinal Microvascular Alterations in Rheumatoid Arthritis Patients without Cardiovascular Diseases", Large Arteries and Microcirculation, PP.19.28, also in Journal of Hypertension: September 2017, doi: 10.1097/01.hjh.0000523718.25889.c8. S. Crespo-Garcia, N. Reichart, C. Hernandez-Matas, X. Zabulis, N. Kociok, A. Joussen, O. Strauss, "Image Processing Allows Reliable In Vivo Detection and Quantification of Retinal Microglia Following Laser-Induced Choroidal Neovascularization", Investigative Ophthalmology and Visual Science, June 2015, Vol. 56, 425. A. Triantafyllou, P. Anyfanti, X. Zabulis, G. Triantafyllou, P. Karamaounas, V. Gkolias, E. Gkaliagkousi , S. Douma, "Association between salt intake and indices of micro and macrovascular function", 25nd Scientific Meeting of the European Society of Hypertension, Milan, June 12-15 2015, also published at the Journal of Hypertension, Volume 33, Supplement 1, 2015:e230. doi:10.1097/01.hjh.0000468055.27366.8. 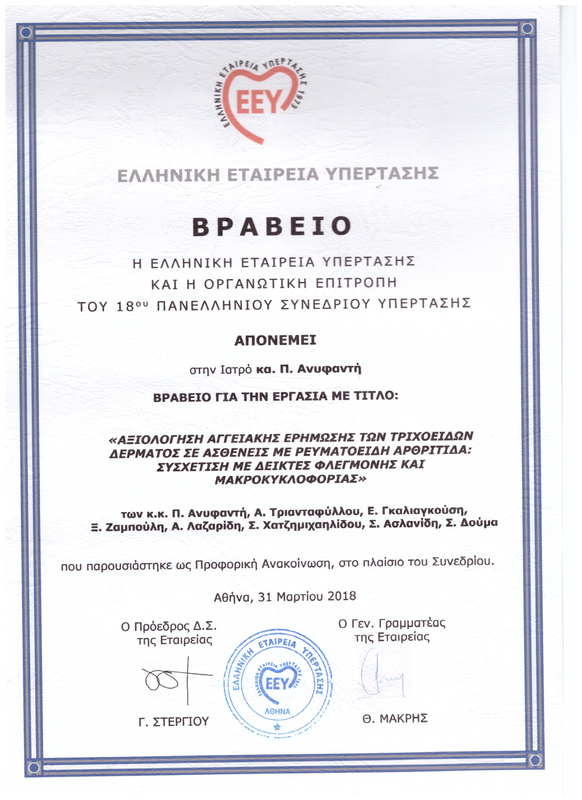 P. Anyfanti, A. Triantafyllou, X. Zabulis, G. Triantafyllou, E.Gkaliagkousi, E. Gavriilaki, S. Douma, "Συσχέτιση Του Λόγου Αρτηριών-Φλεβών Του Αμφιβληστροειδούς Με Αιμοδυναμικές Παραμέτρους σε Δείγμα Νεοδιαγνωσθέντων Υπερτασικών και Υγιών Ατόμων", 15ο Πανελλήνιο Συνέδριο της Ελληνικής Εταιρείας Υπέρτασης, 5-7 March 2015, Thessaloniki, Greece (in Greek). A. Triantafyllou, P. Anyfanti, M. Doumas, X. Zabulis, E. Gkaliagkousi, K. Petidis, P. Karamaounas, E. Gavriilaki, G. Triantafyllou, N. Lazaridis, E. Christaki, C. Zamboulis, S . Douma. "Retinopathy is an independent predictor of arterial stiffness in hypertensive patients and normotensive individuals". 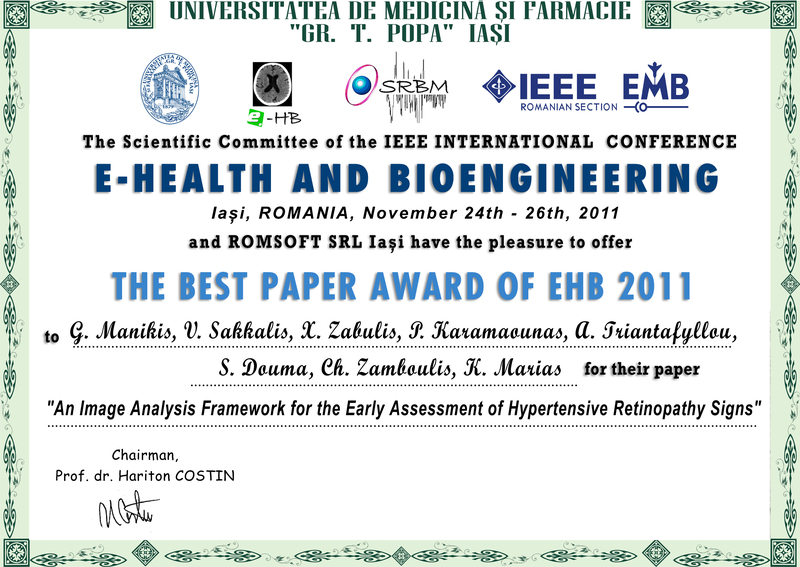 Journal of Clinical Hypertension (Greenwich) 2012;14. Suppl 1:187. P. Karamaoynas, A. Zacharopoulos, K. Hatzigiannakis, M. Andrianakis, K. Melessanaki, X. Zabulis, "Multispectral image registration based on keypoint matching and homography estimation for cultural heritage artifacts", ICS-FORTH, Techinical report, May - 464, 2016. K. Hatzigiannakis, A. Zacharopoulos, X. Zabulis, "Multispectral Imaging for the Analysis of Cultural Heritage Objects and Image Registration for Results Optimisation", ERCIM NEWS, No 108, 24-25, Special theme: Computational Imaging, January 2017. X. Zabulis, A. Triantafillidou, P. Karamaounas, V. Sakkalis, K. Marias, S. Douma, C. Zamboulis, "Eyes (and skin) don't lie", Kathimerini-Economist Special Issue, No 101, p 35, July 2012 (in Greek) PDF.